Review by AllTheBestFights.com: 2017-04-15, pretty good fight between Ronaldo Souza and Robert Whittaker: it gets three stars (UFC Performance of the Night). The black belt in Bjj, judo and former Strikeforce Mw champion Ronaldo Jacare Souza entered this fight with a pro record of 24-4-0 (83% finishing rate) and he is ranked as the No.5 middleweight in the world (currently the #1 in this division is Michael Bisping). He lost to Yoel Romero in 2015 (via split decision, Jacare vs Romero) but then he has beat Vitor Belfort (=Belfort vs Jacare) and Tim Boetsch (=Souza vs Boetsch). His opponent, the black belt in hapkido, karate and Tuf Ww tournament winner Robert Whittaker, has an official mma record of 17-4-0 (76% finishing rate) and he entered as the No.7 in the same weight class. He suffered two consecutive losses between 2013 and 2014, against Court McGee (=McGee vs Whittaker) and Stephen Thompson (=Whittaker vs Thompson), but then he has won six bouts beating Rafael Natal (=Whittaker vs Natal) and Derek Brunson in his last two (=Whittaker vs Brunson). 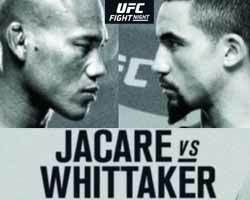 Robert Whittaker vs Jacare Souza is on the undercard of Demetrious Johnson vs Wilson Reis – UFC on Fox 24. Watch the video and rate this fight!